Zhongguohua – often translated as ‘traditional Chinese painting’ – has been the subject of intense debate in China since the beginning of the twentieth century. This working paper seeks to root the artistic ecology of contemporary China in the discussions surrounding zhongguohua that took place in the 1980s. Chinese art has faced many issues over the course of the twentieth century. At the beginning of the century, Chinese politicians were critical of traditional Chinese painting; they emphatically demanded change, even outright revolution, in the medium. This was the first instance of traditional Chinese painting provoking intense debate. These appeals subsequently pushed a group of Chinese students to study realist painting in Europe in order to make up for the insufficient realism identified in traditional Chinese painting. 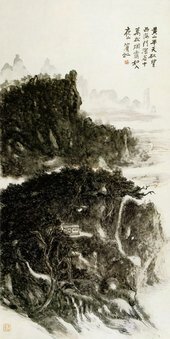 For more than half a century, realism became the mainstream technique and language in Chinese painting. Prior to this point, traditional Chinese painting had been very popular, but after many twists and turns, it faced abolition in the 1950s. 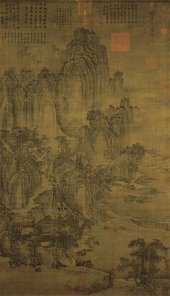 Traditional Chinese painting, as exemplified by Jing Hao’s Mount Kuanglu c.900 (fig.1), did not have a specific name – it was simply called ‘painting’. However, this designation was reviewed after the arrival of Western painting. The response to foreign cultural trends in China at that time is best captured by Confucius’ maxim that ‘If names be not correct, language is not in accordance with the truth of things’. Confronted with difference in the medium, some Chinese intellectuals began to compound the word meaning ‘nation’ or ‘China’ into ‘painting’, in order to distinguish Chinese painting from that which was being introduced from the West: painting became ‘Chinese painting’ (zhongguohua, often shortened to guohua) and history became ‘Chinese studies’ (guoxue). Thus, as a direct consequence of the context from which it emerged, the word zhongguohua has grown to represent an understanding of Chinese culture defined by difference. Throughout the twentieth century, zhongguohua has represented a strong sense of ethnicity and identity in China. Zhongguohua is often translated as ‘traditional Chinese painting’, yet this translation is an over-simplification. The word ‘traditional’ does not fully encapsulate the complexity of zhongguohua, especially given that it resists periodisation. The typically zhongguohua composition and brushstrokes of the paintings of Huang Binhong (fig.2) – an artist working in the 1960s – testify to this. Even today, artists are still employing techniques and motifs that exemplify zhongguohua. As a result, academics have used the pinyin ‘zhongguohua’ or ‘guohua’ to designate the genre a distinctive form. This working paper will engage with the discussions of zhongguohua that took place in China during the 1980s, and makes a case for the continuing relevance of those debates by arguing that they allow us to understand the artistic ecology of contemporary China. From 1949 to 1979, Chinese art was oriented towards socialist realism. From 1949 onwards, socialist art events were regularly organised to promote artistic ideas that served the masses. The artistic methods of this period drew on images and forms beloved by the masses and aimed to promote a new national image. China adopted the Soviet Union’s critical attitudes toward Western modern art. Socialist art was imported to China via Chinese students who had gone to study in the Soviet Union and Eastern European socialist countries. Western modernist art was off-limits, and as a result students seldom studied it. In fact, any Western art created after the classical era was widely considered a decadent product of the Western bourgeoisie and was thus omitted from their studies. In the 1950s, a series of thought-reform movements were created. The 1957 Anti-Rightist Movement mounted a large-scale smear campaign against intellectuals, teachers, artists, and engineers whose work was perceived as containing Western influences. The goal of this movement was to strengthen the political purity of socialism and foster a high degree of ideological unity; a goal that was sustained in the Cultural Revolution, which, beginning in 1966 similarly used extreme cultural nihilism to gain power. By 1976, the movement had caused a great deal of economic and social difficulties for China. The ‘Reform’ and ‘Opening up’ policies of 1979 similarly contributed a significant role in shaping China’s current landscape; although the effects of these policies were radically different to those of the Cultural Revolution. These key moments shaped China’s cultural landscape during the 1980s, as well as forming both the causes and preconditions for the range of changes taking place in China today. Prior to the 1949 revolution, many Chinese intellectuals had embraced a spirit of liberalism. After 1949, such views were no longer acceptable in China, however they continued to bubble under the surface in the years that followed. Thus, when China reopened in 1979, that same intense enthusiasm for new ideas was readily assimilated. These new ideas primarily came from: works of modern Western philosophy by Jean-Paul Sartre, Sigmund Freud, and Martin Heidegger; collections of essays on twentieth century Western culture; and nineteenth century works by Friedrich Nietzsche – all of which were translated into Chinese and published after 1979. These writers had had a deep influence on Western twentieth century thought, but for Chinese scholars and artists living on the mainland after 1949 they were either unheard or unmentionable. As a result, when Western art, books, novels, and poems were introduced to China through new translations, they provoked a wave of intellectual liberation. People felt refreshed, as if they had awakened from a dream. The excitement among scholars and artists was channelled into passionate criticism of the policies of cultural destruction that were enacted during the Cultural Revolution. They began to reflect upon the terrifying impact that authoritarian repression of freedom of thought had had on a closed China. This is the precise context for the period in the 1980s known as China’s ‘intellectual liberation’ or ‘new enlightenment’. Unlike the period from the early twentieth century to 1949, there was no attempt to establish China as a modern nation, nor were there any major wars. Without an awareness of this context, it is impossible to understand the changes that took place in China after the 1980s. These changes and continuities have been represented in a wide range of artistic methods. After the Cultural Revolution ended in 1979, China re-opened and instituted a new series of reforms. Modernisation was the goal of these reforms, which at that time meant the pursuit of modernity in a global sense. However, it once again caused the Chinese people to make comparisons between Chinese and Western cultural values. When the nation was closed during the Cultural Revolution, China took a singular attitude toward the West. The popular phrase ‘it is better to be socialist grass than capitalist rice sprouts’ perfectly captures the blind self-confidence endemic at the time. After 1979, the Chinese people discovered another world, different from the socialist one they had lived in for the past thirty years. Conceptual art was introduced from the West, as well as artistic movements such as realism, modernism and abstraction. In literature, magical realism, psychoanalysis, and American imagist poetry appeared, in addition to writing that employed stream of consciousness and grand narrative devices. The floodgates had opened, and, artists – particularly young artists – had their eyes opened to a wide range of new material. During this time China also began rehabilitating intellectuals and cadres who had been wrongly labelled ‘rightists’ and ‘counter-revolutionaries’ during the Cultural Revolution. China’s reopening sparked a new mood amongst the Chinese people, and, in this period of relative freedom, young art students and artists began to create organisations and study groups. From the northernmost province of Heilongjiang to the southwestern province of Yunnan, art groups in major cities began studying and exploring new art forms. In the literary world, this mood was encapsulated by the poetry of the Misty Poets, who emerged from small study groups organised by young Chinese poets. Many new magazines were founded, such as The Trend of Art Thought (MeishuSichao) in Hubei, Art Translations (MeishuYicong) in Zhejiang, Fine Arts in China (ZhongguoMeishubao) and World Art (ShiieMeishu) in Beijing. These media outlets published articles on new Chinese art, as well as translating articles on foreign art. When new issues of World Art came out, young students would devour them, eagerly passing copies amongst themselves. The magazines provided them with their education in Western art. For example, after the paintings of Andrew Wyeth were introduced, young Chinese painters made realist oil paintings of rural areas. After stories of French surrealism, many artists created exaggerated and distorted surrealist works that depicted Chinese antiquity and reality. After reading articles on Joseph Beuys, many began working with performance art. The experimental and avant-garde attitudes of these young students and artists struck against the views on art championed by the era of the Cultural Revolution. This in turn prompted scholars –especially young scholars – to reflect on Chinese history, culture, and art. For example, the TV documentary River Elegy reconsidered China’s historical characteristics, and the young Ph.D. candidate Liu Xiaobo published ‘On the new literary crisis in China’ in 1986. These new viewpoints on Chinese history and culture were widely discussed and debated among Chinese academics and the general public in a way that was very similar to the cultural atmosphere of the May Fourth Movement. Given this context, it is understandable that when Li Xiaoshan – a second-year zhongguohua graduate student at the Nanjing Academy of the Arts – wrote the essay ‘My Opinion on Contemporary Zhongguohua’, the art world was stunned. Published in the seventh issue of the 1985 Jiangsu Pictorial (Jiangsu huakan), the essay argues that zhongguohua had reached a dead end. Li’s argument was direct, containing no ambiguity or tact; he even criticised the deficiencies of several famous Chinese artists and described their limitations. In 1985, academic criticism of this kind was virtually non-existent in China. Thus, in one fell swoop, Li broke the calm of the zhongguohua world. Before the Cultural Revolution, evaluations of zhongguohua were largely based on political standards that generated strained interpretations. This kind of cultural criticism, informed by Mao’s ‘two-line struggle’, made painters overcautious. As a result, the work from this period was often created in accordance with the government’s artistic standards and requirements. During this period, no one spoke about a crisis in zhongguohua; artists and scholars were too concerned that it would result in the loss of political status after being labelled a ‘rightist’ or a ‘reactionary academic authority’ who was ‘following the bourgeois white path’. Clearly, the political and personal persecution surrounding zhongguohua was not academic but social. Li’s argument echoes Clive Bell’s theory of ‘significant form’ – the notion that when an artwork displays certain formal elements, it can provoke an aesthetic reaction.8 It is entirely plausible that Li read Bell, given that his essay was written during a craze for aestheticism in the early to mid-1980s that had resulted from the translation of a number of key foreign works on aesthetics into Chinese. These texts were highly prized by Chinese scholars and artists alike. They read the works very carefully, and it is clear that Li’s writing style and art historical logic were profoundly influenced by them. By comparing the history of Western style and form to the history of zhongguohua, Li and his contemporaries concluded that zhongguohua forms had become too rigid. Therefore, because Western modern art valued concept, Li argues that ‘We must abandon old theoretical systems and rigid understandings of art, and emphasise the conceptual in modern painting’. He continues, ‘In reforming Chinese painting, we must first alter our adoration of strict formal regulations and break free of formal frameworks.’9 It is here, within his critique of classical art that the shadow of Western modernism within Li’s writing is unavoidable. According to Xue Yongnian, revolutionaries like Chen ‘energetically promoted Western and scientific democracy and intensely criticised the literati painting tradition. The leaders of the New Culture (May Fourth) movement actually believed that the orthodox freehand landscape painting style of the Four Wangs would end because it did not foster scientific ideas… and democratic consciousness’.12 Li’s essay, written several decades after the May Fourth movement, also bore some of these traits, yet his critique of zhongguohua carried the weight of a new era in academic thought. It was written at a moment when established conclusions were no longer taken as fact. The intellectual liberation of the 1980s broke through existing ways of thinking and promoted independent thought. This cultural state provided a fertile academic environment whereby scholars and artists could actively change received wisdom through their work. In Li’s case, his writings caused his readers to consider new concepts of cultural identity and the nation-state, because these were core issues in the debate surrounding zhongguohua. The debates surrounding Zhongguohua are indebted to the context from which they arose: the end of the Cultural Revolution in 1979, and China’s subsequent re-opening to the rest of the world. Certainly, the fast-growing comparison between Chinese and Western culture lay at the centre of these discussions, but they were also born out of a collective anxiety concerning China’s rapidly changing economic landscape. In recent years, the discussion of terms such as ‘zhongguohua’, ‘ink’, ‘modern ink’, and ‘new ink’ still bear the imprint of this collective anxiety, especially in the field of contemporary art. Thus, the meaning of zhongguohua has become even more complex. Time and time again, zhongguohua has been energetically promoted as a bastion of Chinese culture and national identity. However, this practice urgently needs to change. Since the late 1970s, ink paintings have been produced by artists living outside of mainland China that have been reincorporated into the canon of zhongguohua. Liu Guosong, for example, produced Dharma 1974 (fig.3) as well as many other paintings whilst living in Taiwan. Hou Beiren has continued to produce new ink paintings since he emigrated to the United States in 1956; Golden Peak of the E’mei Mountain 2015 (fig.4) provides one of the more recent examples. Both Liu and Beiren have demonstrated through their work the sheer vitality and enduring possibility in the medium. Their respective innovations in Chinese ink painting have in turn stimulated many contemporary ink artists to explore new methodologies. The work of Jizi, here exemplified by two ink paintings The Extension of Time 2013 (fig.5) and Soul World Trek 2014 (fig.6), testifies to the legacy of artists like Lue and Beiren, as well as the debates of the 1980s surrounding zhongguohua. For Jizi, the case for the contemporary relevance of ink painting in China was best made through its production. His paintings both recalled the heritage and renaissance of zhongguohua as well as carving a space for its contemporary possibility. Yet, if we are to truly achieve a natural and open cultural landscape we must first escape from the binary between China and the West. Chinese art should not simply serve to exemplify a competition between zhongguohua and ink, nor a struggle between China and the West. Rather, the intrinsic properties and variations of each work should determine its existence, even if they themselves are loaded with rich political and historical resonances. Dr Wang Chunchen is the Head of Curatorial Research of CAFA Art Museum at the Central Academy of Fine Arts China, as well as an Adjunct Curator of The Broad Art Museum of Michigan State University. He was Curator of the Pavilion of China at the 55th Venice Biennale in 2013, and is Deputy Principal Editor of the Journal of Contemporary Chinese Art and Editor-in-Chief of the Chinese Contemporary Art series published by Springer-Verlag, Germany. This working paper was published on 7 February 2017. 2. Li Xiaoshan, ‘My Opinion on Contemporary Zhongguohua’, reprinted in in Li Xiaoshan (ed.) Discussions of ‘My Opinion on Contemporary Chinese Painting’, Jiangsu Fine Arts Publishing House, Nanjing 1990, p.4. 3. On the Ultra-Stable Structure of Chinese Society, Hunan People’s Publishing House, Hunan 1984. 4. Li Xiaoshan, ‘My Opinion on Contemporary Zhongguohua’, p.4. 6. After the Cultural Revolution, the first influential book on Nietzsche was Nietzsche: At the Turn of the Century (Nicai: Zaishiji de Zhuanzhedianshang), by Zhou Guoping, which positively evaluated the influence of Nietzschean philosophy. The book was published by Shanghai People’s Publishing House in 1986, but, prior to this date, academic articles and Chinese translations of Nietzsche had appeared in mainland scholarly publications. 7. Li Xiaoshan, ‘My Opinion on Contemporary Zhongguohua’, p.6. 8. Clive Bell developed his theory of significant form in his 1914 book Art, which was translated by Zhou Jinhuan and Ma Zhongyuan in 1984 and published by the China Federation of Literary and Art Circles Publishing House. 9. Li Xiaoshan, ‘My Opinion on Contemporary Zhongguohua’, p.6. 10. Kang Youwei, ‘On Painting from the Ten-Thousand Tree Cottage’ (‘Wanmu Caotang Lunhua’) in Gu Sen and Li Shusheng (eds. ), One Hundred Years of Classic Chinese Art (Bainian zhongguo Meishu Jingdian), Shenzen 1998, vol.1, p.1. 11. Chen Duxiu, Academic Articles on Twentieth Century Shanshui Painting (Ershi Shiji Shanshuihua yanjiu wenji), Shanghai Calligraphy and Painting Publishing House, Shanghai 2006, p.4. 12. Xue Yongnian, ‘An Overview of the Changes in One Hundred Years of Shanshui Painting’ (‘Bainian Zhongguo Meishu Jingdian’) in Lu Fusheng and Tang Zheming (eds. ), Academic Articles on Twentieth Century Shanshui Painting (Ershi shiji shanshuihua yanjiu wenji), Shanghai Calligraphy and Painting Publishing House, Shanghai 2006, p.3. 13. Both essays are published in Li Xiaoshan (ed.) Discussions of ‘My Opinion on Contemporary Zhongguohua’ (Dangdai Zhongguohua Zhiwojian Ttaolunji), Nanjing 1990. 14. Si Gui, ‘Analysing an Intellectual Trend’ (‘Xi Yizhongsichao’) in Li Xiaoshan (ed.) Discussions of ‘My Opinion on Contemporary Zhongguohua’ (Dangdai Zhongguohua Zhiwojian Taolunji), Nianjing 1990, p.250. Wang Chunchen, ‘Collective Anxiety About Zhongguohua: A Thirty Year-Old Debate’, Tate Research Publication, 2018, https://www.tate.org.uk/research/research-centres/tate-research-centre-asia/collective-anxiety-about-zhongguohua-thirty-year, accessed 19 April 2019.